Newgrange is one of the finest examples, not only in Ireland, but in Western Europe, of the type of tomb known as a passage-grave. Its probable date of erection is about 3000 BC. It belongs to a time when stone, not metal, was the everyday material for tools and weapons. No metal has yet been found in a primary context in an Irish passage-grave. The tomb consists, as the name passage-grave implies, of a passage and chamber, the walls and roof of which are built of large slabs without mortar. A large circular mound or cairn of stones covers the tomb and a kerb of massive slabs laid on their long edges, ends touching, surrounds the base of the cairn and was intended to act as a retaining feature. Surrounding the mound but situated from 7 to 17 meters outside it, is a circle of tall, widely spaced standing stones. The Circle is 103.6m (340 ft) in average diameter and encloses an area of about two acres. For those familiar with Stonehenge, it may be pointed out for comparative purposes that the outer bank of that monument is 320 ft (97.5m) in mean diameter. The two inner circles within the great circle at Avebury are each 340ft in diameter. There is of course no known relationship between these monuments and Newgrange. This is more properly called a cairn as it is made up of medium-sized water-rolled pebbles, 15 to 22cm across. White quartz stones were used as an outside finishing layer, at least in the entrance area. Quantities of these were collected during the excavations which took place between 1962 and 1975 and have now been restored to the outside of the mound. Round boulders of granite, about the size and shape of a child's football, rugby style, which were found with the quartz, must also have been employed as a finish and they can be seen today interspersed with the quartz in the revetment wall. The theory has frequently been adduced that they were used as mauls to dress the slabs but it is clear that this was not their purpose. A continuous girdle of large slabs surrounds the base of the cairn. With the passage of time, this had collapsed downward over the kerb so that the latter had become hidden. Previous to the excavations only three kerbstones were left fully exposed, the Entrance Stone directly outside the mouth of the passage, Kerbstone 52 diametrically opposite the Entrance Stone on the north side of the mound, and Kerbstone 67 to the east. Twenty-one stones are now fully exposed to the left of the entrance and eighteen to the right, while a further eight can be seen at the back of the mound. This enables one to get a good idea of what the monument must have looked like when newly built. Many of these newly-exposed kerbstones are decorated but the three first-mentioned are by far the most striking. Only the tops of the remainder are uncovered, as one can see if one makes a circuit of the mound. Before dealing with the tomb proper a structure must be mentioned which rests on the front part of the passage roof about 2.4m back from the entrance to the passage. Before the cairn material was removed from this part of the roof in 1963 so that the orthostats (standing-stones) in the passage beneath could be straightened up, all that could be seen of this structure was the decorated front edge of its roofstone. As soon as the cairn material was removed the structure was discovered buried underneath it but quite intact except for a certain amount of subsidence at its north and east sides. The decorated edge of the roofstone first came to light, according to W. R. Wilde, a few years previous to his first visit to Newgrange in 1837 and from then on it was to be seen protruding through the cairn above the entrance. Indeed its continued preservation was little short of miraculous since one Richard Burchett described to the Society of Antiquaries in London in 1874 how he 'uncovered its whole surface, but found two men with crowbars incapable of moving it without greater risk to its safety than I was willing to incur'. He went on to say that 'its mysteries therefore remained unsolved'. Up to 1963 when the cairn was removed from about it the existence of the structure beneath was not even suspected. The name 'False Lintel' was applied to the decorated roofstone as it was believed to be no more than a relieving lintel for the passage entrance. The roof-box, as the structure is now called, is situated over a small gap, 20 to 25cm wide, between the first two roofslabs of the passage. It is through this slit that the rays of the rising sun penetrate to the chamber at the time of the midwinter solstice. The roof-box is 90cm high, 1m wide, and 1.2m from front to back. The entrance to the tomb is in the south-east of the mound but for ease of description it will be referred to as the south; thus, the passage will be said to run south to north and the sides of the passage to left and right will be the west and east sides respectively. The tomb chamber is entered through a long passage lined on each side with standing-stones; there are 22 on the left-hand (west) side and 21 on the right (east). They average 1.5m in height above present ground level but there is considerable variation among individual slabs, those nearest the chamber are the tallest, being almost 2m high. The first part of the passage is roofed by three large slabs which rest either on the tops of the orthostats at each side of the passage or on slabs (corbels) resting on the orthostats; the roof-box is situated over the gap between the first and second of these roofslabs. After this first more or less horizontal stretch, the roof is corbelled, that is, the slabs are set one on another so that each one rests partly on the roofslab beneath it and partly oversails it so that a gradual rise in height is achieved. Seen from the passage below, a straight run of corbelling such as this resembles somewhat the underside of a stairs. There are 17 roofslabs in all in the passage as viewed from below. The combined length of passage and chamber is 24m (79ft); it can be seen, therefore, that the tomb occupies only about one-third of the total diameter of the mound. The passage is 18.9m (62ft) long and about lm wide. The height, as we have seen, varies; the first part is from 1.5 to 2m high but as the corbelling rises, so does the height until the last roofslab, RS 17, is 3.6m above the floor. The forward edge of this slab when viewed from the chamber can be seen to have a pattern of four divided lozenges carved on it. Three side-chambers or recesses open out of the main chamber to left (west), right (east) and straight-ahead (end or north), so that on plan the whole tomb has the shape of a cross with a very elongated shaft, the passage being the shaft and the three recesses the arms and head. It need hardly be emphasised that this cross or cruciform shape has no connection with Christianity as Newgrange was built more than three thousand years before the birth of Christ. It will be noticed that there are only four orthostats, strictly speaking, in the main chamber; the others constitute the sides and backs of the recesses. The east recess is the most lavishly decorated. The chamber is 5.2m (17ft) long from its entrance to the back of the end recess and 6.5m (21ft 6in) wide from the back of the west recess to the back of the east recess. It is 6m (20ft) high at its centre point. The recesses are between 2.4 and 2.8m high. Large chiselled stones to which the name basin stone is given occupy the floors of the recesses. They are a feature of some Irish passage-graves. Those who have visited Dowth and Loughcrew will be familiar with the basins there. There are four at Newgrange: one in the west recess; a broken, incomplete one in the north recess; and two in the east recess, one standing inside the other. The upper of these two (pi. 6) is particularly well-shaped and is of granite in contrast to the others which are of sandstone and slate. One of the finest examples yet found is in the eastern recess of one of the recently opened Knowth tombs - Knowth East. The basin stones would have contained the bones - either unburnt or burnt, or both - of those for whom the tomb was built. With them would have been placed funeral offerings of pottery, bone pins, stone balls and pendants, stone and bone beads, and perhaps flint arrowheads. It is not to be expected that these would have survived intact in the Newgrange basin stones since the tomb chamber has been accessible for more than two hundred years. Nonetheless, when the floor of the chamber was excavated in 1967 a small quantity of human bone was recovered together with some typical grave-goods such as pendants, balls or 'marbles' and fragments of bone pins, sufficient at any rate to show that the tomb was used for burial and was not, as has been suggested, a cenotaph or a temple. The basin stone in the west recess is almost rectangular, measuring 1.2m by 90cm; the interior is flat and there is a very slight lip for about two-thirds of the perimeter. That in the north recess is in several fragments but a basin of about 1.2 by 1.8m is suggested; there is a very slight lip on one fragment. The upper of the two basin stones (pi. 6) in the east recess is chiselled all over, both inside and out. Note the two circular depressions 20 and 45cm respectively in diameter, which are sunk close together just below the inside of the rim. Their purpose is not known. This basin is almost circular, having a rim-diameter varying from lm to 1.2m. The lower basin is a good deal larger and is also a splendid specimen; it is rectangular in shape, measuring 1.8 by 1.2m. A tomb such as Newgrange would lead one to suppose that it must have been destined as the final resting-place of a leading or kingly family (passage-graves were collective tombs) but in the absence of the kind of evidence that has proved so informative in other lands, notably in Egypt, we can only speculate about the matter. Many visitors will be familiar with the ancient tales which relate that the kings of Tara were buried at Newgrange. It is called Bru or Brug na B6inne in these accounts. The tale is told that Cormac mac Airt, one of the most famous of the Tara kings, did not wish to be buried at the Bru because it was 'a cemetery of idolators', but in spite of this his servants tried to take his body there. The river Boyne however, 'swelled up thrice, so as that they could not come' and the pious Cormac was buried at Ros na Righ across the river after all. Another body of ancient tales associates the Bru with Oengus, one of the Tuatha De Danann, a legendary pre-Celtic race. Oengus was known as Oengus an Broga and the Bru was often called the House of Oengus. Once again, many visitors will know the story in the Fionn Cycle which in translation is called 'The Pursuit of Diarmaid and Grainne'. In this, Oengus watches over the lovers, rescues the lady when Diarmaid is hard-pressed by his enemies, and finally, when the hero has died through a knavish trick of his rival, Oengus brings Diarmaid's body back to the Bru for safe-keeping. Alas, these are but tales. 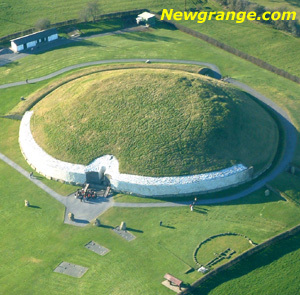 Newgrange was already several thousand years old when the kings of Tara ruled. We do not know who built the Boyne tombs nor who were interred in them. There are more than 200 passage-graves in Ireland at present and there were originally more. It is generally thought that the practice of building passage-graves came to Ireland from Brittany, nevertheless, as far as the actual people who built them are concerned, very little more is known about the Boyne tombs now than in the days when they were attributed to the kings of Tara or to the Tuatha De Danann. Towards the eastern boundary of the Newgrange enclosure visitors will notice settings of concrete posts and slabs. Two separate features are involved. The one nearer the kerb of Newgrange consists of a series of concrete uprights which mark the centre points of large deep pits which had been dug in three parallel arcs. The continuation of these arcs runs out of the excavated area at each side, i.e., to south and east. If the rows of pits formed complete circles, the centre point would be somewhere in the field outside the Newgrange enclosure on the east. They would not therefore have been concentric either with the kerb of the main mound or with the Great Circle. Furthermore, the curvature is too great for the arcs to bear any relationship to Site Z nearby. The pits averaged 1 to 1.5m in mean diameter and about 1 to 1.25m in depth, though individual pits were in some cases up to 2m deep. All were emptied in the course of the excavations and apart from animal bones and flints, no clues were obtained regarding their purpose or their date. All that could safely be said was that they were filled up before the cairn began to collapse and before the beaker people arrived. In the case of one of the pits, a beaker hearth had been built over the filled-up pit. The other feature is the satellite passage-grave, Site Z, which was discovered during the excavations. It had been almost totally destroyed in the past, presumably in order to facilitate tillage. Those of the orthostats which were recovered intact have been re-erected in their former positions; only the sockets of the remainder were found and the positions of these are marked by concrete slabs. The plan of the grave and of part of the kerb may thus be traced. The remainder of the mound lay outside the enclosure and was not excavated. The quartz found during the excavation is piled up in one part of the site. A curious little stone structure can be seen on the down-hill slope behind the Newgrange mound to the north-east. It was built from the stones which had slipped off the cairn in the past and which lay scattered roundabout. It is presumed to be one of the 'follies' beloved of landlords in a more spacious age. 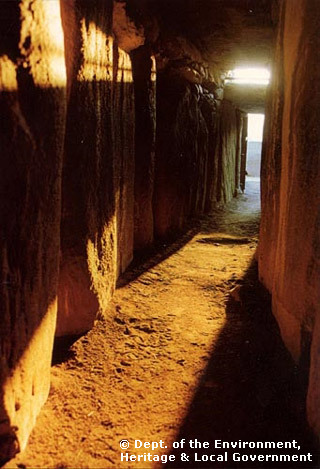 As one enters the Newgrange enclosure from the road, a standing-stone can be seen on one's left hand. This was originally lying in a drain in the townland of Dowth close to Site H but it was removed to its present position in recent years for safe keeping. It is ornamented on two faces.